Assessment scales can be defined at the customer (site) level by the system administrator. They can also be set by a teacher at the course level. They are used to denote the grade scale for assignments or other assessments. The scale allows many different types of scale (e.g. A+ to F-, A to F, Pass/Fail) to be used. Which 'Assessment Scales' are Included in the Data Warehouse? This entity includes all the assessment scales. Assessment Scales are used when assessing student work. The are used by the assessment tools in itslearning such as assignment, test, task, grade book and LTI tool (for return grade). When a teacher assesses a student's work, or the work is assessed by an eternal tool, the score/grade can be mapped to or one of the assessment scales. For each assessment, a teacher will as a minimum be able to 'complete' an assignment for a student, but it is also possible to assess the answers with either a rubric or an assessment scale or score. Administrators can create and manage Assessment Scales at the organisation level - this means they are consistent across all assessments. Teachers can add and manage their personal assessment scales per course under Settings>>Assessment scales. These are reflected in this entity. The entity shows the latest version of each assessment scale. AssessmentGrade - assessment scales contain assessment grades. 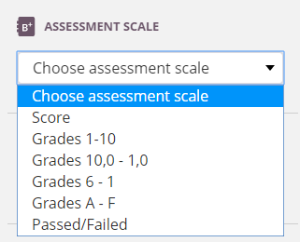 Course - a course has assessments that use an assessment scale.